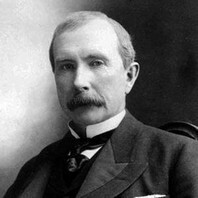 Billionaire and co-founder of Standard Oil Company, the first formidable U.S. business trust. He was a noted philanthropist. He worked as a bookkeeper for a produce commission firm. He was often considered the wealthiest person in history, even after adjustments were made for inflation. He married Laura Celestia Spelman and had five children with her. He entrusted his only son John Rockefeller Jr. with his oil empire and foundations. I know of nothing more despicable and pathetic than a man who devotes all of the hours of the waking day to the making of money for money's sake.